Watch the video: The state has been without a budget for 41 days. Is there a compromise on the horizon? 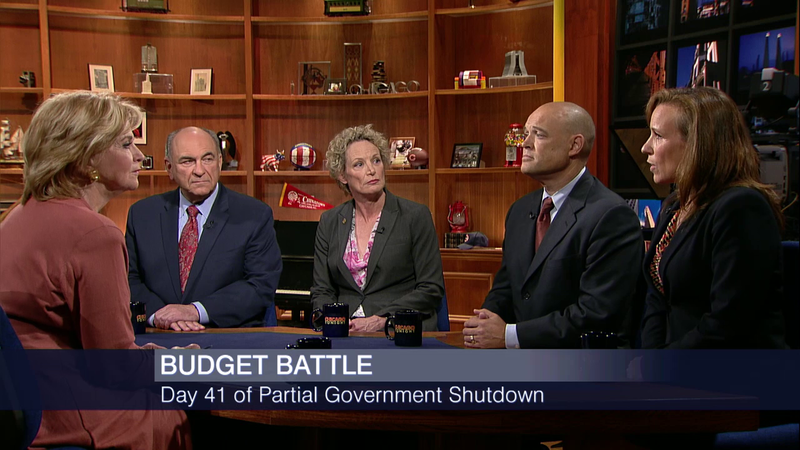 Carol Marin talks with four member of the Illinois House of Representatives about what's happening this week in Springfield. The panel includes State Rep. Lou Lang (D-Skokie) who is the deputy majority leader; State Rep. Elaine Nekritz (D-Buffalo Grove), who is the assistant majority leader; State Rep. Ron Sandack (R-Downers Grove), who is the Republican spokesman for both the judiciary and restorative justice committees; and State Rep. Barbara Wheeler (R-Crystal Lake), who is a member of a number of education committees and the committee on museums, arts and cultural enhancement. Lou Lang: The issue we have is the same issue we’ve had. We passed a budget to the governor and the governor vetoed the whole budget. He could have fixed it if he thought it was an inappropriate budget, but he vetoed it because he has a list of non-budgetary items and he refuses to discuss the actual budget of the state of Illinois until we comply. I believe that if there was a conversation strictly about the budget, it would be done. Ron Sandack: I am hopeful that things will get done. I am hopeful that there will be a meeting in the middle and some compromise. Yes, it’s taken far too long. We’re here in August now and we’re not where we should be. However, bipartisanship is still something new and I remain hopeful. Barbara Wheeler: There will be and should be a comprehensive budget plan that includes all three: Governor Rauner, the Democrats, and the Republicans. I’m encouraged. Elaine Nekritz: If the income tax had not rolled back, we would not be having this discussion. We would be able to be paying our bills and we’d still have to make cuts. But we would be able to make the pension payments, we’d be able to do all those things. So this is an eminently solvable problem and it’s a relatively short-term problem that we have. LL: We’re going to come back with a bill that the governor promises to sign to restore about $4 billion in federal funding to some important programs that need it that he never should have vetoed in the first place. So, now he’s going to sign it, but he could have fixed that two months ago. EN: I would hope that we can get about the business of governing. I feel like in many ways we’ve brought Washington-style, 52 weeks-a-year, 24 hours-a-day campaigning to Illinois, and really what we should be, in this really dire circumstance, is really focus on governing. EN: We’re going to have to come to some compromise to help CPS manage their budget, but they have to be willing to help themselves as well, and I think this message of ‘it’s all Springfield’s fault’ is really not fair to taxpayers and providing them the honest information that they need to know what their choices are about the revenues that are needed for CPS and the city of Chicago and the cuts that would have to be made. LL: I think it will have to part of an overall budget package. I’m not sure that there will be sufficient votes to just simply send the city of Chicago $450 million unless we come to some agreement on some other items. EN: What the governor asks with everything is ending collective bargaining. I don’t think that’s the right path for Illinois to drive down wages, that’s not Illinois’ future. RS: There’s no bill to end collective bargaining and there won’t be a bill. There is a bill that empowers local units of government to decide what is collectively bargainable for themselves. BW: The one consistent message since the day Governor Rauner was elected is that he will have cuts, he wants reforms, and he’s willing to talk about tax revenue. I don’t think the people in the state of Illinois want to give more money to the state of Illinois because they don’t trust that it will be spent wisely. Interview highlights represent a condensed version of our panel discussion. Watch the video to see the full discussion.